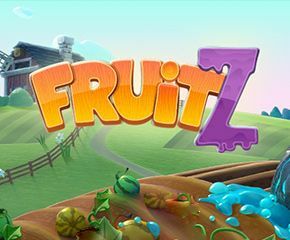 Foxium has come up with a new slot, Fruitz that is very different from other online slot games and accounts for the reason for it to appeal to most players. The concept is such that you will see a fruit machine which turns upside down converting fruits into undead zombies who keep on chasing the sheep in the background of the farm landscape. The winning of the player is decided by a country girl who sits and hides behind some cover with a shotgun in her hand to protect herself from all the deadly creatures visible on the screen. It has five reels, three rows of symbols and twenty-five pay lines. The players can change the bet size but the number of paylines is not changeable by the players. The bet starts from 0.25 that would reflect 0.01 per payline. To make a bet, you can select among twelve different sizes for your total wager. 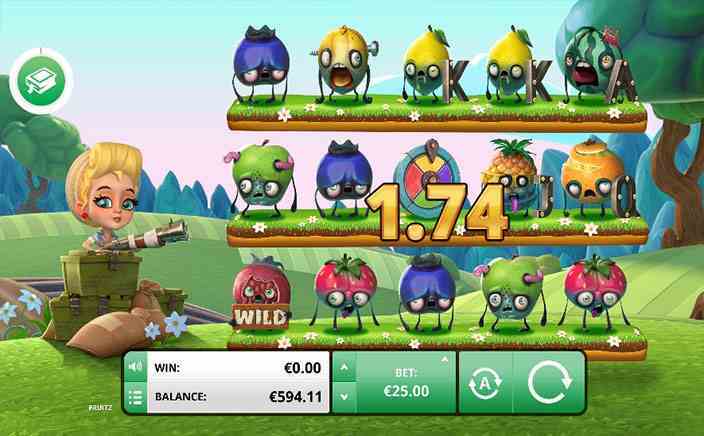 The gameplay of Fruitz slots is different from the other online slots. Firstly, there is a Card collection feature on which you pick a random card every time you get a chance on the reels. From eight different set of cards, there are four cards in each set which makes the total of thirty-two cards. The players get the payment immediately according to the cards in their hand. And each time you get a new card, RTP will increase for next twenty spins. Fruitz slots have three wheel symbols that appear on first, third and fifth reel need to reflect on the reel together to take the player to the wheel feature. It will randomly choose from many bonus games. The other exciting feature of the slot is ‘Shooting crates’ where you get bullets to fire at twelve crates. You can win a cash prize or more bullets to try further. Also, you can win eight free spins with a sticky wild and five free spins with two random reels that are initially locked in as completely wild. Fruitz slots give the players a chance to win up to 500x jackpot and some other special features, you just need to be aware of those zombies who can pick and smack you up. So, you need to be beware of them and keep playing and winning huge. The slots game certainly promises to give you a good dose of entertainment.